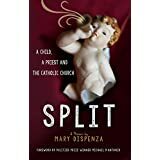 I’m very happy to announce that my memoir, SPLIT : A child, a priest, and the Catholic Church is now available. The ebook is available from most online booksellers. The triumphant cherub on the cover is blowing her horn just in time for the holiday season. Though SPLIT deals with the difficult subject of childhood priest abuse, my story also involves some very interesting insights ,from my years as a nun, into the workings of the Catholic Church. And perhaps best of all, there’s a happy ending! My aim in writing SPLIT was to weave enough hope into the story to leave the reader uplifted, rather than depressed and wanting to hide under the covers. I think I succeeded and I know you’ll enjoy the book. You can purchase both the ebook and the paperback now at Amazon, Barnes and Noble, Powell’s City of Books, the iBook store and other online booksellers. If you’re in the area of Bellevue, Washington on November 23rd, please come help me. Friends, family and fans joined me for the official launch of SPLIT at the University Book Store on November 23, 2014. We had a great time. My plan is to keep everyone up to date on what I’m doing during this exciting book launch season. You can use the handy form below to subscribe to updates to my blog, where I share news and opinion on the ongoing priest abuse scandal, helpful information for survivors, and ideas for anyone who wants to help bring the epidemic of child abuse to an end. You’ll also automatically receive messages about publication developments, events I’m attending, where you can buy the book and special gifts. And many thanks for reading! I am so proud of you and can’t wait for the release of your amazing memoir! What a journey you have traveled!